Apolonija Å¡uÅ¡terÅ¡iÄ, Carola Beerhues, Marga Chirazi, Ursula Haverkamp. Jutta Maier, Gisela Overloeper, unemployed women of Warendorf region. 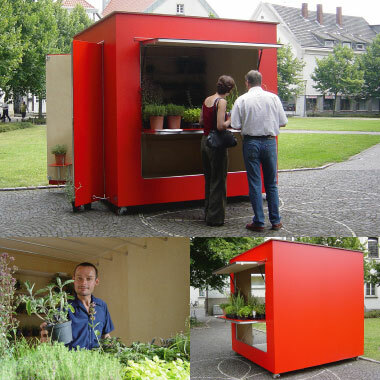 The project Street Shop Box was devised as a transformable unit composed by: a sculpture/street shop box that was placed into the local market. Its goal is to give employment to one unemployed woman, in her fifties, which would take care of the products of the land from the beginning up to the stage of sale. It also changed from a Public-Sculpture on non-working days, into a Market Stand on working days. The idea was to create a very simple economic unit for one or more unemployed women from the Warendorf area. The new business proposal was based on the use of the land and sale of the products produced from the land. The Street Shop Box was designed and built as a transformable object, which can change from a Public_Sculpture on non-working days, into a Market Stand on working days.